This week I installed two beautiful Winderlite panels that look like the inside of a waterfall. The Customer is delighted with the transformation, saying that; "They look fantastic" and is now thinking about having some more made for a sliding wardrobe door. 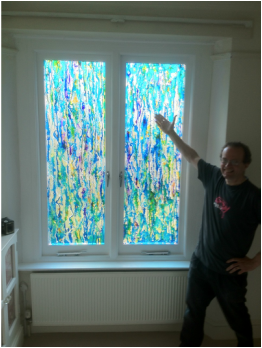 The windows were commissioned as a result of our meeting at the surface design show earlier this year. This was a great show for me as I met lots of interesting people all looking for interesting ways to "solve problems" around the house. In this case the customer's bedroom was on the ground floor and was overlooked by a public footpath! My product solved it in a very artistic and practical way. The window is now obscured, and acts as a decorative focal point to the room. In this instance my toughened glass units needed a new wooden frame, as the old one was perished due to age. I am often asked, can you help me? I have a window in my home that is ugly, the glass is cracked, the view is horrible, it lets in the rain, it's droughty and I cant stand net curtains. -Is there anything you can do to help? Fantastic! let me at it! I can change it into a beautiful work of art I am a genius when it comes to glass light texture and colour. But- I here you ask -why choose me? are there not other glass people out there - What makes Me and Winderlite so special? I would say that Winderlite is a unique way of creating stained glass- if you surf the web you will not see anything like it in terms of technique style or artistic content. It is unusual in that it is 3 dimensional, kinetic and is dynamic on a daily basis. Therefore if you enjoy original works of art, and you enjoy "normal" stained glass, you enjoy light and colour, you will find me as an artist, a craftsman and a technician all rolled into one exactly what you need. I have a habit of really getting to grips with what you want, and have the 34 years experience in stained glass to know what works and what doesn't- and most importantly how best to execute it. Winderlite is to me, a very exciting medium through which I can express myself in a way that enhances your enjoyment of your home. I love working with it, and I love being asked to make it for people. I enjoy making a difference. I am friendly, versatile and passionate about helping you enjoy a thing of beauty. So my question to you is; What are you waiting for? 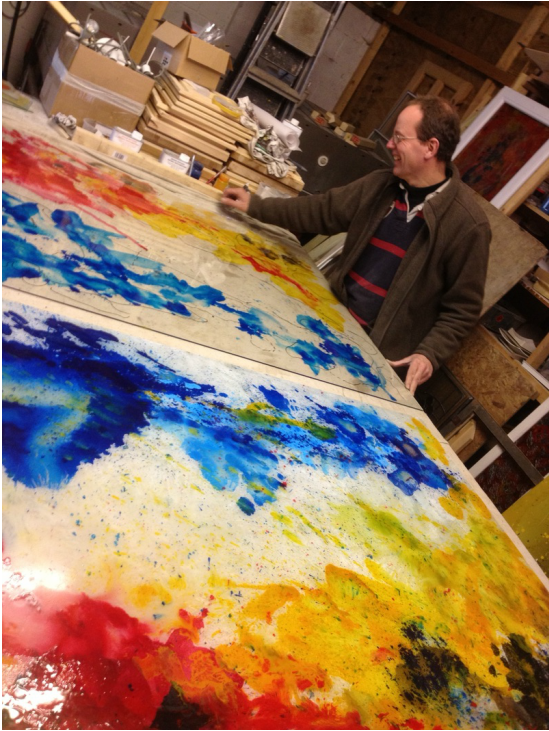 Glass artist Matthew Lloyd-Winder in the studio working on a recent staircase Winderlite panel commission.